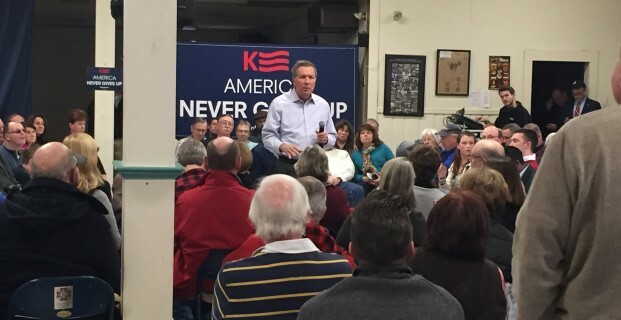 The one campaign event I saw during my visit to New Hampshire last weekend was a John Kasich Town Hall event held in Milford where about 200 people showed up to politely grill the candidate. Kasich, a former Senator and current Governor of Ohio, is the latest Republican to poll at high enough numbers to take the #2 slot in the Primary race. But, as you can read in Critical Voter (out next Monday), using polling data to underlie belief in short-term trends is a foolish endeavor, driven by humankind’s tendency to treat quantitative information with more respect than it may deserve. But today I’d like to talk about people, rather than numbers. Specifically, the activity where people most often engage (or disengage) their critical-reasoning facilities: argumentation. Almost everything you encounter during a political campaign, for example, can be seen as a form of argumentation. Debates, political TV ads, direct mail pieces, and speeches before groups large and small are all built on premises that an arguer (such as a candidate) want you to accept in order to reach their preferred conclusion. But there are other important things to consider when dealing with argumentation, such as today’s topic: the audience. To illustrate this point, most of you have probably seen televised Town-Hall-style candidate events which have become increasingly popular as a format, with even Presidential debates taking place in the give-and-take environment of candidates answering questions put to them by “the public.” But there is a big difference between a Town Hall that takes place in a VFW Hall vs. a similar event recreated in a television studio. For during an untelevised Town Hall (like the Kasich event I attended), there is no ambiguity over what constitutes the audience (the people in the room). Yes, the press might also be in attendance. But unless something surprising happens (like the candidate getting shouted at or stumbling over a question particularly egregiously), the arguer (in this case the candidate) can generally address his or her attention and arguments solely at a seen audience. In contrast, when such events are shown on TV the candidate must address multiple audiences at once: the people in the room, unseen voters watching on their screens, as well as unknown numbers of similarly unseen reporters, opponents and political operatives. Making a successful argument requires a strong understanding of your audience, but it is not always obvious what constitutes that audience. When two lawyers square off in court, for example, they might seem like opponents engaging in a debate. But this is misleading since each lawyer couldn’t care less what the other thinks since, for them, the audience they want to convince consists of just the judge and jury. Debates (whether between high-school debate team members or presidential candidates) are similar in that the real audience persuasive arguments are directed towards do not include those arguing one side or the other. This explains why televised presidential debates can seem so maddeningly artificial since they are structured in a way to make it seem like opposing candidates are trying to argue a point with each other when in fact they are trying to convince a wider (usually unseen) audience of entirely different points (like how smart or tough they are). Perhaps this is why Kasich seemed so comfortable addressing specific voter concerns at his Milford Town Hall, uttering phrases you would never hear in other settings (such as “I don’t agree with you, but I promise to think about my position a bit more if you’ll promise to do the same”), a sentence that would get him damned as a wishy-washy flip-flopper if said during televised national debate, even if it represents the kind of thoughtfulness we actually want in a candidate after they get into office.